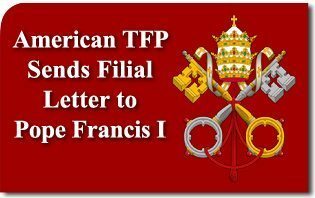 Following the election by the cardinals in Rome of the new Pontiff, Francis I, the American TFP sent His Holiness a letter beseeching Divine Providence to protect his ascension to the Papal throne, as well as thousands of petitions gathered during the conclave. 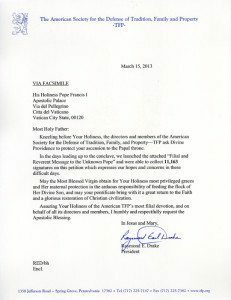 Kneeling before Your Holiness, the directors and members of the American Society for the Defense of Tradition, Family, and Property—TFP ask Divine Providence to protect your ascension to the Papal throne. In the days leading up to the conclave, we launched the attached “Filial and Reverent Message to the Unknown Pope” and were able to collect 11,163 signatures on this petition which expresses our hopes and concerns in these difficult days. May the Most Blessed Virgin obtain for Your Holiness most privileged graces and Her maternal protection in the arduous responsibility of feeding the flock of Her Divine Son, and may your pontificate bring with it a great return to the Faith and a glorious restoration of Christian civilization. Assuring Your Holiness of the American TFP’s most filial devotion, and on behalf of all its directors and members, I humbly and respectfully request the Apostolic Blessing. This entry was posted in Statements and tagged America, Apostolic, blessing, Christian, civilization, conclave, devotion, Divine, faith, filial, Francis, holiness, letter, message, Papacy, Petition, Pope, Providence, statement, TFP, Unknown by The American TFP. Bookmark the permalink.